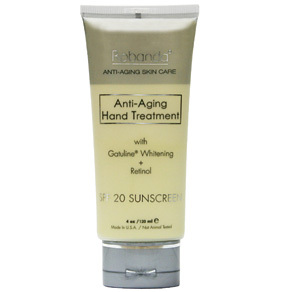 Antioxidant anti-aging hand lotion with retinol penetrates deeply to combat the aging process and help fade dark spots. Non-greasy cream also contains vitamin A and SPF20. 4 oz. Active: Octinoxate 7.5%, Octisilate 5%, Oxybenzone 3% Inactive: Water (aqua), glycerin, dimethicone, C12-15 alkyl benzoate, stearic acid, glyceryl stearate, sclerotium gum, glycyrrhiza glabra (licorice) extract, fragrance (parfum), cetyl alcohol, PEG-100 stearate, triethanolamine, aspergullus ferment, ethoxydiglycol, carbomer, retinyl acetate (Vitamin A acetate), retinol (Vitamin A), tetrasodium EDTA, tocepheryl acetate (Vitamin E acetate), polysorbate 20, butyrospermum parkii (shea butter) extract, propylparaben, phenoxyethanol, methylparaben, Yellow 5 (CI #19140), Red 40 (CI #16035). 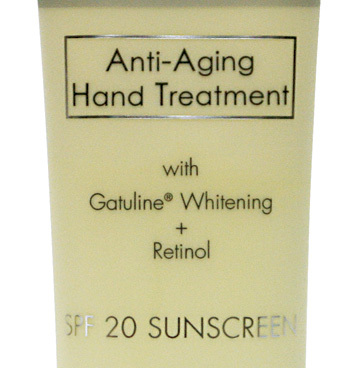 Apply to hands twice daily, or as desired. Every product I have purchased from Easy Comforts in the past few years has been exceptional. I have never tried this product but based upon my satisfaction with other products, I decided to give it a try.